WASHINGTON — A pilot program of the U.S. Army’s Multidomain Operations task force has cut its teeth in the Pacific area of operations and will continue to shape the service’s future doctrine, designed for operations against peer adversaries in more challenging environments, according the U.S. Army Pacific commander. Unlike the development of the “AirLand Battle” doctrine developed after the Vietnam War, the multidomain operations doctrine can’t take 14 years to take shape, Gen. Robert Brown told Defense News in an Aug. 15 interview. The Multidomain Task Force — or MDTF — is helping to advance the new doctrine and prepare the force to better operate in current conditions. The U.S. Army plans to stand up a task force to develop its multidomain battle concept through exercises in the Asia-Pacific region. What the Army is learning through the MDTF’s participation in Pacific theater exercises is going straight into doctrine when it’s proved out on the battlefield. “We are spinning it right off, and some of it is going into our doctrine that is being developed by the Army right away and some of it can be used — God forbid — if we had to fight tonight, we’d put it in right away,” Brown said. The commander equated the task force to the Army’s new cross-functional teams assigned to take on the service’s top modernization priorities. The CFTs fall under the new four-star-led Army Futures Command geared toward modernizing the force. The CFTs will rapidly develop prototypes that will be battle-tested and integrated into the force, with some of the first major capabilities expected within a few years. Multidomain Operations — formerly known as Multidomain Battle — is a relatively new concept the Army is forging into doctrine. Army Chief of Staff Gen. Mark Milley debuted the concept in the fall of 2016, which seeks to transform the way the Army will fight against emerging threats and how it would operate against near-peer adversaries in denied environments across all domains — sea, air, land, space and cyber. Multidomain Operations is guiding the Army’s modernization priorities, which seek to make major leaps forward in the areas of long-range precision fires, combat vehicles, vertical lift, the network, air-and-missile defense, and soldier lethality. Army Secretary Mark Esper announced at the Association of the U.S. Army’s Global Force Symposium in Huntsville, Alabama, in March, that the service would stand up a Multidomain Operations task force that would help rapidly inform the creation of doctrine. He said a prototype of the task force would stand up the following year. But that task force is already robust and active in the Pacific, most recently taking part in the largest exercise in the theater — Exercise Rim of the Pacific, or RIMPAC — this summer. It was initially envisioned that the pilot program would be no more than 2,000 people, but the service is finding that it needs roughly 400-500 core personnel that are considered essential. The Army designated the 17th Field Artillery Brigade out of Joint Base Lewis-McChord, Washington, to be the core unit of the task force. 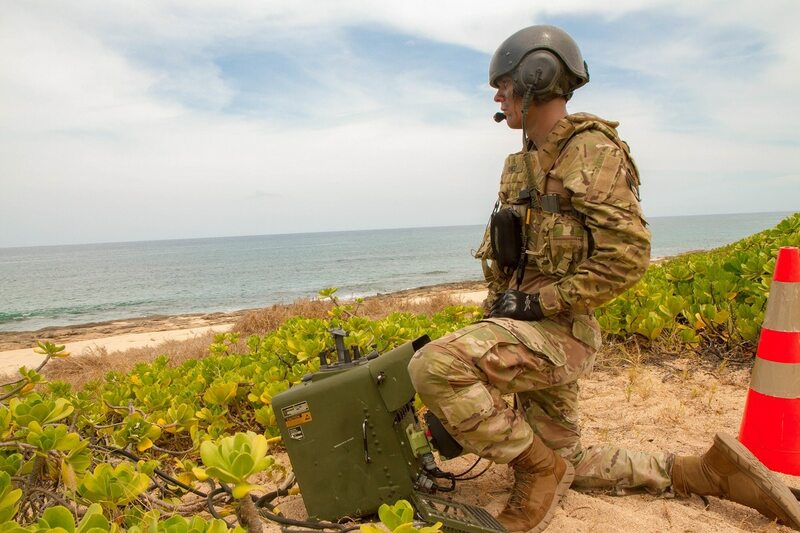 While it was not the task force pilot’s first exercise (that was Talisman Sabre in Australia in 2017), the pilot program played an integral role in RIMPAC, conducting, in one example, multiple live-fire engagements against a maritime target off the coast of Kauai, Hawaii. Brown said the Army pitched the idea to U.S. Pacific Command to make RIMPAC a multidomain operations exercise; and, to the service’s surprise, the command jumped on board. The exercise caused all the services to think outside of the box to increase the level of joint operations and figure out how to provide multiple dilemmas to the enemy, according to Brown. The task force pilot successfully conducted a high-mobility rapid infiltration on a C-17 aircraft from Lewis-McChord, from Washington to Kauai, and set up an effective mission command from Kauai and Schofield Barracks, Hawaii, that demonstrated the ability to rapidly project power to create new land-based threats for adversaries. The MDTF also successfully integrated Gray Eagle unmanned aircraft systems, AH-64E Apache attack helicopters in manned-unmanned teaming formations, and P-3/P-8s into the Link 16 network. The task force, in a combined exercise, sunk the decommissioned landing ship tank Racine as part of the exercise, and shot down two aircraft in a simulation using an Avenger air-defense system and a man-portable system. “We need to totally integrate as a joint force,” Brown said. “We depend on the other services’ capabilities we don’t have, but we want to present the commander and leadership with options because we are integrated so well. The demonstration is likely to raise eyebrows in China. The Army and the other services were able to connect things “across the board that had never been connected,” such as using ballistic missile defense and air defense artillery to go after cruise missiles, as well as linking sensors and shooters, owned by multiple services, “in ways that had never been done before,” Brown said. The Army also tested manned-unmanned teaming, used prolifically in Iraq and Afghanistan with AH-64Es and Gray Eagles. The service tried it in a maritime environment during RIMPAC, but also linked these assets to other maritime and air assets “like they never were before,” according to Brown. The plan is to keep pushing the capability of the MDTF in the coming year, according to Brown. The task force is lining up to participate in the Army’s routine exercise with allied countries in the Pacific — Pacific Pathways — next year with at least two foreign countries, possibly Australia and Japan, Brown said. He also hopes to see some of the prototypes coming out of the Army Futures Command’s CFTs incorporated into the task force’s operations in the coming years, noting pretty much everything being developed would be of interest to multidomain operations in the Pacific, but particularly long-range precision fires capabilities — the Army’s No. 1 modernization priority. While the MDTF is getting its start in the Pacific theater, the vision is to have multidomain operations capability across multiple combatant commands, such as Europe, positioned forward as a deterrent. Brown would like to see a couple of MDTFs in the Pacific as well as Europe, saying “there is no doubt” that eventually even brigade combat teams will have embedded multidomain operations capability because they will need to consider the cyber domain, the space domain and how to link with joint partners in order to be effective in multidomain ops.